Earlier this year, Export Development Canada (EDC), a Crown corporation mandated to promote Canadian exports and investment abroad, was tasked with running Canada’s new development finance institute. While EDC has for decades facilitated business in developing economies, its mandate is an exclusively commercial one. Its new objectives of poverty alleviation and sustainable development will require it to finance private investment that respects human rights and is protective of the environment. The Crown corporation will need to effectively guard against corruption and promote transparency. Is it prepared for this new role? 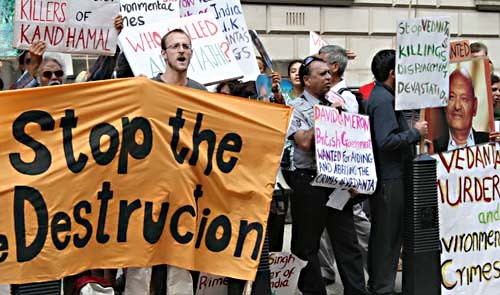 Protestors at 2010 shareholder meeting of Vedanta, one of several EDC clients with a troubling track record on human rights. Photo source: Peasant Autonomy (www.peasantautonomy.org). EDC has long-standing internal policies on human rights, environment, disclosure and anti-corruption. The corporation states that it assesses environmental and social risks when screening prospective clients, and aims to promote and protect internationally recognized human rights. Its environmental and social risk advisory team has a full complement of experts specialized in areas such as environmental management, biodiversity, community engagement, occupational health and safety, labour, human rights and climate change. However, like all export credit agencies, EDC discloses virtually no information on how it applies its policies to determine client eligibility. To gauge the efficacy of its due diligence process, observers must look to the composition of its portfolio. A review of EDC’s client list reveals that the agency has in recent years financed companies associated with credible allegations of human rights violations, environmental harm or corrupt practices. The Norwegian fund has also excluded Vedanta Resources and its subsidiaries, citing the companies’ record of complicity in human rights violations, including the forced eviction of tribal peoples in India. The fund first listed Vedanta for exclusion in 2007, and concluded last year following a thorough review that “there continues to be an unacceptable risk of the company causing or contributing to severe environmental damage and serious or systematic human rights violations.” Yet EDC recently opted to lend $100-250 million to the company’s subsidiary in India, Vedanta Limited. An in-depth investigation published in 2016 by the International Federation of Human Rights linked the operations of EDC clients Ecopetrol and Pacific E&P (now Frontera Energy) with a range of rights violations in the oilfields of Puerto Gaitán, Colombia. The Colombian Constitutional Court suspended Pacific E&P’s activities after determining that it violated the fundamental rights of the Sikuani indigenous people. Ecopetrol and Frontera are just two of EDC’s clients in the fossil fuel industry. Although EDC describes itself as a partner in the Canadian government’s climate change efforts, it provided an astounding $10 billion in support to the oil and gas sectors on average each year from 2013 to 2016. Last year, EDC facilitated the sale of Internet filtering technology by Canadian company Netsweeper to the government of Bahrain – a country criticized internationally for widespread suppression of human rights defenders through censorship, surveillance, arbitrary detention and torture. When members of the Standing Senate Committee on Human Rights questioned the financing on human rights grounds, an EDC representative stated that the company was no longer a customer. EDC’s strategy for avoiding corruption has had mixed results. Earlier this year, leaked documents revealed that EDC financed the sale of a Bombardier luxury jet to a company owned by the Gupta family, South Africans with close ties to President Jacob Zuma, who are implicated in well known, widespread allegations of corruption. More than a year before the Guptas were approved for financing by EDC, a South African government inquiry determined that they had abused their political influence for personal gain. These and other transactions raise serious questions about the efficacy of EDC’s screening policies. While the Crown corporation is developing additional policy guidance for its nascent development finance institute, its track record in this area gives cause for concern. To credibly fulfill its new mandate, EDC must adopt far more robust due diligence practices to avoid financing companies involved in wrongdoing. To earn public confidence, it must disclose detailed information about those practices. Further, in line with Canada’s G20 commitment to phase out public subsidies to the fossil fuel sector, the Crown corporation must cease its support to oil and gas companies. Without such measures, EDC risks repeating the mistakes so often made by other development finance institutions in supporting investments that end up displacing or otherwise harming some of the developing world’s most impoverished and vulnerable people. Above Ground > Publications > Opinion Pieces > Is EDC ready to run Canada’s new development finance institute?